There’s a great photo project that’s on display at USD right now. The (IN)VISIBLE PROJECT is a self-contained gallery space for a photo project shot by Bear Guerra. It combines beautiful black+white portraits of local homeless people with audio recordings of the subjects telling their stories. This kind of thing done poorly would be a one-note bummerfest/exploitation but Bear’s take weaves a diverse set of stories together in a way that’s illuminating and like any good art - provokes recognition. In my case - a recognition that the homeless population is extremely diverse in itself as are the causes of homelessness. Like many people, my interactions with homeless people are limited to fleeting moments of uncomfortable eye contact at intersections and little more. The show was a nice opportunity for me to think a little deeper. I helped Bear set the show up last Sunday. Toward the end of the day I found my inner voice chattering non-stop about homelessness – something I’m personally very afraid of. So much of it seems to be just bad luck. One man in the exhibit, a ship worker, tells his story – he was transferred to SD by his company then laid off six months later without enough money to get home. He didn’t have family that could help him. It took so little? I’ve had the idea for a while now that life is much more like Plinko than I would like to admit and listening to these stories partly confirmed that. The randomness, the unexpected intervention of bad luck into these people’s lives is frightening. If the world really is that random, and I believe it is – then we need a great deal of help from one another. And that unfortunately is an idea we individualistic Americans are not well invested in. On the surface the (IN)VISIBLE PROJECT is a meditation of one city’s homeless population but beneath that I think it’s also a look at the downside of a core American value – that we are individuals responsible only for ourselves. The up side is that we’re allowed to claim all of our successes as self manifested – but if we fail, we fail alone. 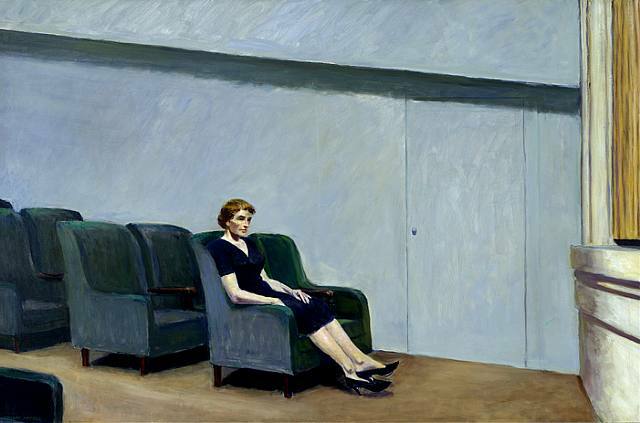 There are reams of American artists who’ve studied the loneliness implicit in these values but Edward Hopper comes to my mind first (you could argue that his figurative paintings are not studies of people but the spaces between people). If you’ve never been alone or lonely then you’ve never been American. Check out the show, it’s free and will be up for another week.